The world-wide fitness phenomenon Vibration Training has reached Australia and is now available for everyone. Just exercising for 10 minutes on the VIBRO TRAINER is equivalent to 1 hour at the gym. The VIBRO TRAINER is designed in Australia based on scientific research specifications for maximum results. It has a tilting platform developed to simulate the natural up/down action during normal walking. The vibration feels more natural and is better for you. It has an amplitude of approx 2mm for minimal impact on joints and a wide range of speeds/Hz, auto programs and a BMI program to monitor your progress. The VIBRO TRAINER comes with a 2 year warranty (5 year motor warranty), an Exercise Mat, Resistance Bands, Exercise Chart, Beginner DVD, optional Intermediate and Advanced exercise program DVDs; targeting the upper, mid and lower parts of the body. Beginner DVD, optional Intermediate and Advanced exercise program DVDs; targeting the upper, mid and lower parts of the body. 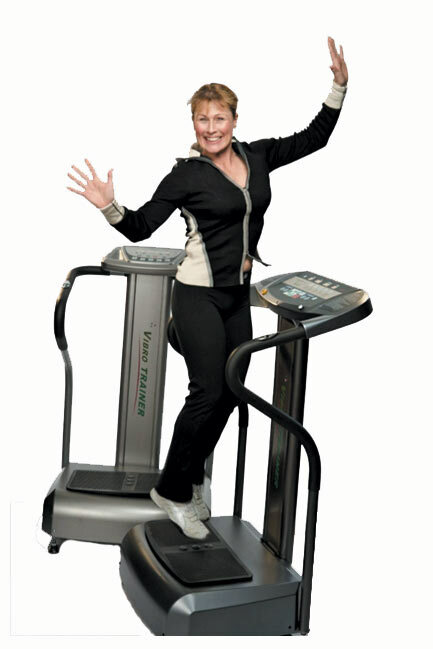 The VIBRO TRAINER has a tilting platform developed to simulate the natural up/down action during normal walking. The vibration feels more natural and is safer for you. The VIBRO TRAINER has a heavy duty oscillating system at each end for a longer life capacity and there is an acupressure plate on the base to stimulate blood circulation. It has an amplitude of approx 2mm for minimal impact on joints and the arms go to the back for a greater range of exercises on the plate. There is a wide range of speeds/Hz, auto programs and a BMI program to monitor your progress. NEW, Modern Streamlined Model NOW AVAILABLE! The Commercial VIBRO TRAINER features a high quality 3HP high torque variable speed motor, a speed/Hz range from 5 – 35 and a weight capacity of 150+Kgs. NEW, Modern Model with 7" Touch Screen NOW AVAILABLE! The Deluxe Commercial VIBRO TRAINER features a high quality AC variable speed motor, a speed/Hz range from 5 – 40 and a weight capacity of 180+Kgs. Good Vibrations Exercises DVD professionally demonstrated by Physiotherapist Alison Ford author of Actively Ageing.